Well, I finally made something to show on this blog. 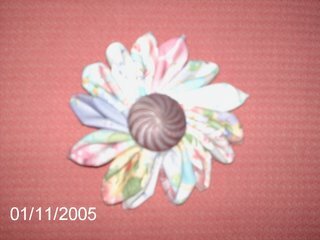 It's my first fabric pin made from quilt squares. I'm still working on the decoupaged purses and making these pins in between drying coats of paint (and in between boring doctor dictation reports). The back is messy but who will see it. Anyway, it's my first attempt. Sorry about the blurry pics and pay no attention to the date. I have yet to figure out how to not make the date show and to take clearer pics. The button is vintage and the color is lavender-like and the fabric is from Dena Designs. 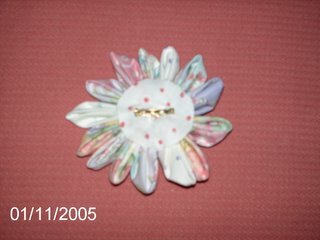 It is pastelly and spring-like but that was what I had laying around the house. It was pretty easy to make. 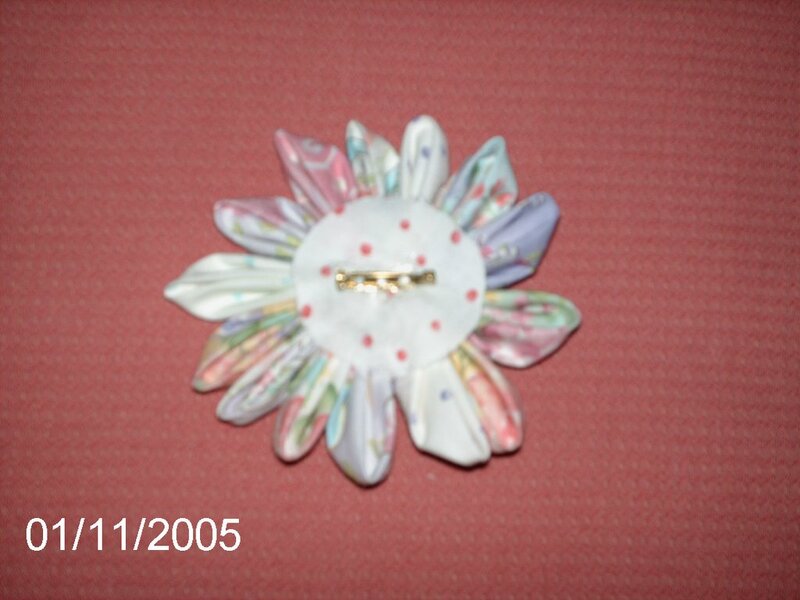 Click on Fabric Pin at the top of this post for the link to the tutorial. Happy to get to know you! hi jessica- thats cool! picture posts up and ready to rock blogger style! Your fabric has already shipped out from JAPAN! You'll get them within a week or so! hey jessica hows it going? i was hoping youve (finally) recieved your package????!!! i just got word from the person i sent AFTER i sent yours that he recieved already! gosh- sana ikaw din! hey you changed your template ! i love it too! how did you do that? tutorial! hehe. thanks for leaving wonderful feedback! both bags too!